This book investigates what may become of human civilization, who is setting the agenda for a trans-humanistic civilization, and why. The modern Victor Frankenstein holds a high political office, carries diplomatic immunity, and is most likely funded by the largest corporations worldwide. His method is ancient: alchemy. His fraternities are well known and their secrets are well kept, but his goal of times past and present is the same; he dares to become as god, genetically manipulating the seeds of the earth, the beasts on the fields, and to claim legal ownership over humanity by re-creating it in his own image. This is no fairy tale, science fiction, or conspiracy theory … it simply is! 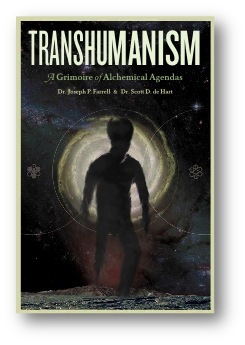 Transhumanism, a Grimoire of Alchemical Agendas by Dr.s’. Joseph P. Farrell and Scott D. de Hart lifts the veil from the macabre transhumanistic monster being assembled and exposes the hidden history and agenda that has set humanity on a collision course for the Apocalypse. IN ADDITION we want to remind you about some killer events happening all over in the next few weeks! DON’T MISS THE PROCESS MEDIA EXHIBITOR TABLE AT WORDSTOCK IN PORTLAND THIS WEEKEND!! You can find the entire book fair’s schedule of events HERE. We will be sharing the table with a beloved author, Kristy Athens, who will be reading from her acclaimed book Get Your Pitchfork On! The Real Dirt On Country Living on Sunday at 5PM at the Work For Art stage! I know we put out her book and all but really if you haven’t seen her read yet, her wit is something to behold. Kristy will be hitting Wisconsin shortly after as will Feral House and Process Media’s own Adam Parfrey. SEE THE EVENT INFORMATION BELOW! ADAM PARFREY WILL BE PRESENTING RARE AND ILLUMINATING IMAGES THROUGH A SLIDE PRESENTATION THAT GIVES A HERETOFORE UNEXAMINED LOOK AT AMERICAN HISTORY. HE WILL BE IN THE COMPANY OF PETER SOTOS TALKING PURE FILTH AND JOSEPH SCOTT MORGAN TALKING DEATH INVESTIGATION, AT SELECT EVENTS. With Peter Sotos presenting on Pure Filth. See the venue’s website HERE. View and join the Facebook event HERE. With Joseph Scott Morgan reading from Blood Beneath My Feet.